Apologies to all for the lack of updates this year. We’ve had a few delays as some of our authors received opportunities from other publishers, and we are looking forward to getting back to more publications. There will be more updates in the days to come, but currently, we are looking at having some more books come out in the superhero genre, including a possible Kickstarter with HeroNet Files, Vol. 2. Wayland Smith and Harry Heckel both have novels in the works. We may also potentially have some open submissions in the beginning of 2016. In the meantime, thank you for visiting our site and supporting our authors. October 24, 2014 11:22 pm / 1 Comment on Price Drop! Happy October! We have a treat for everyone. We’ve dropped the Kindle price of In the Service of the King, the first Crimson Hawks Adventure, to $1.99. The eBook price will be falling in other channels as well over the next few weeks. The story of James Markson and the Crimson Hawks is a fun swash and buckle adventure, with several twists and turns along the way. Author Harry Heckel has been focused on his other projects this year, including work with Harper Voyager under his pen name of Jack Heckel (with his co-author John Peck). 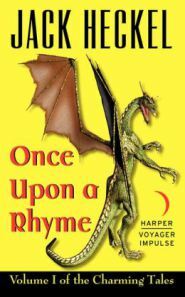 If you enjoyed Once Upon a Rhyme from Harper (on sale currently at 99 cents! ), you may enjoy the drier humor of the Crimson Hawks. We’re in discussions with Harry on the second book in the Crimson Hawks series. Check in for excerpts. Additionally, we’ve also reduced the price on Harry’s black powder dark fantasy series, the Krueger Chronicles. The eBook prices of Souls of the Everwood and Balefire and Brimstone have already gone down to $1.99 on Amazon and should also fall soon on other channels. All three books are available in print from Amazon, but those prices will remain the same. We will be at the Hanover Book Festival again this year. We are thrilled to say that Harry Heckel and Wayland Smith will both be there signing books. Stop by and see us if you’re in the area! Congratulations to our author Harry Heckel and his co-author John Peck! Their series of novels, The Charming Tales, is being published by Harper Voyager under the pen name Jack Heckel. The first book, Once Upon a Rhyme, is available for pre-order and will be released on August 26. The second book, Happily Never After, is also available for pre-order and will be released on November 11. Of course, there’s no need to wait to read Harry’s work – you can pick up HeroNet Files, The Krueger Chronicles (Souls of the Everwood and Balefire and Brimstone) or In the Service of the King right now! Currently, we know that our authors Harry Heckel and Wayland Smith are working on new NaNoWriMo projects – best of luck to them! You can look at Harry Heckel’s blog for more on his effort – he has also been quoted on the WordPress blog about his NaNoWriMo philosophy (twice, so far – here and here). Great job, all you NaNoWriMo participants! Balefire and Brimstone by Harry Heckel is now available in paperback from Amazon. We now have the cover art for Balefire and Brimstone. Book 2 of the Krueger Chronicles is coming soon! Those of you who have been eagerly awaiting its release will also note that it has a new name, which we thought fit the book better.